Can I buy a shirt? For a limited time 2018 race shirts are available only to registered participants who show their current year race bib number or to volunteers showing their current year Staff Shirt at Village Runner, Manhattan Beach. Cash only. $15 or 2 for $20 or get one free if you use the coupon on the back of your bib number while making a purchase at Village Runner Manhattan Beach until October 31, 2018 (while supplies last and limited to selection available). Wish you had a different shirt? If you are looking to exchange a shirt for a different size/style, please bring your unworn, clean 2018 shirt you previously received to Village Runner, Manhattan Beach right away to possibly get the size/style you want. We do our best to help...we want you to be happy! Our timing company, Race Wire, posts results near the finish line as they become available. Additionally, they are usually available within hours of the finish on this website. 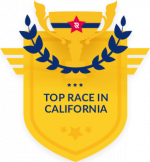 For past race results, please click here. Need to request a correction? Please submit corrections to support@racewire.com. Corrections must be requested in a timely manner, as results are made final the Wednesday following the race. After this day, no other changes or additions will be made. When are results made final? Results are made final Wednesday following the race. After this date, no other changes or additions will be made. All youth under the age of 9 who complete the entire course receive a ribbon and are NOT announced at the Awards ceremony. Our official age groups start at age 9. The MB10k offers 2-member team categories comprised of FAMILY MEMBERS only. Teammates need not run together. Medals will be awarded to the top 10 combined running times in each category. If you are running with a group of friends or co-workers or charity, have fun! We do not officially recognize or time any team categories except the above. How do I enter the 200+lbs category? Awards go to the top 10 finishers in each division including teams (combined time) and 200+lbs. Congratulations if you're one of them! There is an Awards Ceremony immediately following the race. If you miss the awards ceremony, your medals will be taken to Village Runner Manhattan Beach for you to pick up (until 10/31). Any unclaimed awards are then recycled for future use. Due to the expense of postage, we do not mail awards. You may send someone on your behalf to pick up your award. Endurance Sports Photo is on the course to provide you with quality race photos. They will email you directly once photos are available. You may also Click here to search photos from previous Manhattan Beach 10K's. The Manhattan 10k is a 10 kilometer (6.2 mile) race. There are no other distances offered. Please see the MB10k Course & Exit Map and note the START and FINISH areas. After the race please check out our expo for all kinds of goodies: bagels, fruit, pizza, cold drinks, swag, massages and more provided by our awesome sponsors! The expo is located in the South and North upper pier parking lots. Julius Gidavuday ran it in 30:03 in 2002. D'Ann Arthur ran it in 34:10 in 2014. Streets reopen to vehicular traffic on a rolling basis approximately at a 20-minute per mile pace. Participants still on the course at this time will be required to move to the sidewalks and obey all traffic signals. The FINISH Line closes approximately 2 hours after the start of the race. Participants who cross the FINISH Line after 9:30AM are not guaranteed a finish time. The disposable timing strip is attached to your race bib. Do NOT remove the timing strips or you will not have a recorded time. Your race bib is worn on the FRONT of your body. Yes, many bands and many fans! We keep you well entertained along the way! Sweat storage or bag check available? Parking is limited and we recommend riding your bike, getting dropped off, or residential street parking. Please refer to MB10k Course & Exit Map when making plans to park, and note that streets on the course will close at 6am race morning. We ask that you be quiet and courteous when parking in the community. Sorry, no. Please make arrangements for getting to the START line on time, as no finish times will be adjusted for late arrivals. Note: we are NOT affiliated with the Hometown Fair Shuttle. Need to exit city and want to avoid delays/detours during race? 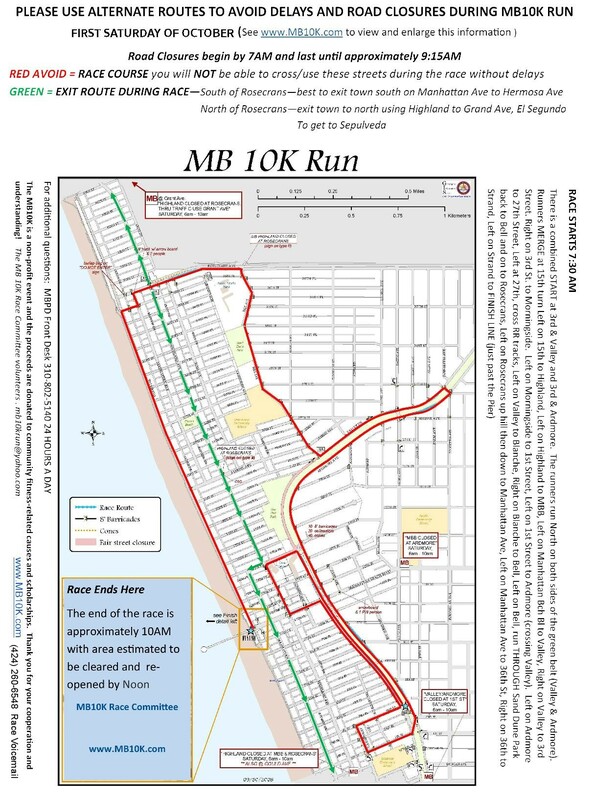 Please see this MB10k Course & Exit Map. Your life will be easier if you avoid crossing the red course area. If you have a very specific issue, please contact the MBPD at the number provided on the map. Yes, at the same start time as runners. We ask that walkers start near the back of the group to ease congestion. No. Due to extreme risk to other runners/walkers, we do not allow pets on the course. May I run with a baby stroller/jogger? No. Due to extreme risk to other runners/walkers, we do not allow strollers/joggers on the course. Please respect this and have your child and babysitter be your #1 fans at the race. Are roller skates, inline skates, bikes, or strollers allowed on the course? No. Due to extreme danger to other runners/walkers we do not allow any of these on the course. No. We offer online registration beginning July 1st and walk-in registration at Village Runner, Manhattan Beach beginning August 29th. Please register early for the best pricing and the best chance of getting in before we sell out. No. Bib number pick-up is at Village Runner, Manhattan Beach. Please see your online registration confirmation email (needed for number pick-up) for pick-up details. Don't panic! Replacement numbers can be processed at Village Runner, Manhattan Beach beginning Wednesday prior to race day. If you discover your missing number early race morning, just come to the INFORMATION table on the Greenbelt near the race start, and be there before 7am. Can I register via fax or email? After exiting the FINISH LINE area, head back towards Manhattan Beach Blvd to claim your finisher's shirt. You must have your race number with you to receive your shirt. Note: shirt styles/sizes are NOT guaranteed. Please go to shirt distribution immediately upon finishing for the best chance of getting the shirt you want. How are finish times & awards recorded? Electronic chip timing is the most accurate timing system available and allows your time to start when you reach the starting line, instead of when the gun goes off. We use Chronotrack chip timing. You will see the pre-activated timing strip on the back of your race bib. Do not fold or remove this strip. Age group awards are determined by chip time. There is no alternative timing system and participants must be in starting area at 7:30AM gun time, as the timing mats are not left on indefinitely. Because our course doubles back on itself, the START mats must be turned off shortly after the start. Participants must cross the START mat to record a start time, and this must be done within the first few minutes of the race in order to be included in the results. For previous year's race photos, 2002 through 2012, please contact the photograph company directly: http://www2.brightroom.com/search. You can also contact The Beach Reporter for archives of old newspapers. Is the MB10k on Social Media? Sorry we do not offer refunds. Please know that your entry fee is funding a non-profit race organized by volunteers and all the profits are donated back to the community of Manhattan Beach. No. Register early for the best pricing. Follow us on social media for early pricing alerts. Do you offer group registration? Our registration process is set up for individuals, as a signed waiver is required for each participant (parent/guardian signature required for participants under the age of 18). For that reason, group registration is not available. Special bib numbers for prior winners? Yes, if you were a prior overall winner or division winner, we're happy to issue a special number at your request. Note: available at walk-in registration only on a first come first served basis. The first running of the race was October 1978. Are there people who have run every race? Yes, there are many! We call this special group of people The P.I.E.R. Group...that stands for Participated In Every Race! Members of this special group can be recognized on race day by the color of their race shirt - theirs is printed on a different color to distinguish them from the crowd and to honor their commitment to the MB10k. Give them a shout out when you see them on the course! Who organizes the Manhattan 10k? The race is organized by a private group of individuals known as the Manhattan 10k Race Committee. Since the first race in 1978 it has been a volunteer effort and no one gets paid for the work they do organizing the race. There are approximately 30 committee members and some have been with the race since year one. Is the MB10k a non-profit event? Yes! The proceeds go to community fitness-related causes and scholarships. Entry fees over the years have helped fund local par courses, the Mira Costa High School Track, The Strand Mile Markers, the synthetic turf at the Marine Avenue soccer field, and the 2014 play structure at the Live Oak Park Tot Lot....just to name a few! Is the Manhattan Beach 10k Run affiliated with the Hometown Fair? If you're looking to support the race with a product or service, please email us at mb10krun@yahoo.com Please know that space is limited and to keep a variety we cannot say yes to everyone. Do email us for consideration. We appreciate it! If our FAQ's don’t answer your questions, please e-mail us at mb10krun@yahoo.com or you can leave a message on our race hotline: 310-374-2397 (email is preferred). The MB10k is one of the few 10k races in the nation that is volunteer organized. No one on the Race Committee receives compensation and all generously give their time throughout the year to plan the event. In addition, it's made possible with the support of the City of Manhattan Beach and a lot of fabulous community members who donate their time as well. While we love the support of Village Runner, they're our 'hosts' for in-person registration, race expo supporters, award pick-up and much more; they don't organize the event. Please email the MB10k Race Committee any feedback/comments: mb10krun@yahoo.com. While you're on the course, please make sure to thank the volunteers along the way! Where can race information be found other than this website? We offered a light blue shirt that's a super soft, high quality cotton, in your choice of long or short sleeve.